Bookstein Projects is pleased to announce an exhibition of recent paintings by Paul Resika, as he enters his ninetieth year. This is the artist’s ninth show with Lori Bookstein and the first with Bookstein Projects. An exhibition of related paintings from the same series will be on view at Steven Harvey Fine Art Projects from April 18 – May 20, 2018. Painted over the last three years, Resika’s compositions are, as ever, a balancing act between the observed scenes of his surroundings and the fantastic – sometimes entirely fictional – motifs he reshapes them to be. The sand dunes of Cape Cod may be familiar, but their level of abstraction will come as something of a surprise to viewers acquainted with the artist’s lush landscapes and seascapes of the 1980’s and 90’s. In this latest body of work, Resika’s long-standing concern for captured light and his signature painterly strokes have become instruments of a growing linearity and geometry. Sand dunes and the moon are reduced to metonymic triangles and a simple circle, respectively. Sea and sky are turned into barely interrupted planes of color, while our traditional orientation towards space and depth is repeatedly uprooted. Paul Resika (b. 1928, New York, New York) studied under Hans Hofmann as a teenager in New York and Provincetown before departing for Venice and Rome in 1950 to study the old masters. After casting aside Hofmann’s abstract principles, his Italian palette turned sober and descriptive. Upon his return to the United States, Resika devoted himself increasingly to the exploration of light and color, and the synthesis of abstraction and representation. 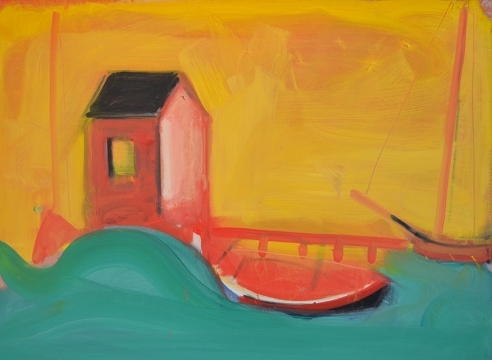 Over his eight decade-long career, Resika has exhibited at the Peridot Gallery, Graham Modern, Long Point Gallery, Provincetown, Berta Walker Gallery, Provincetown, Hackett-Freedman Gallery, San Francisco, and Salander-O’Reilly Galleries, New York. Resika splits his time between New York and Truro, Massachusetts. Resika’s work is included in the collections of the Hood Museum of Art, the Metropolitan Museum of Art, the Museum of Modern Art, the Smithsonian American Art Museum, the Whitney Museum of American Art, and the Addison Gallery among numerous others. He is the recipient of a Guggenheim Fellowship (1984) and has been elected Academician at the National Academy of Design (1978) and the American Academy of Arts and Letters (1994). 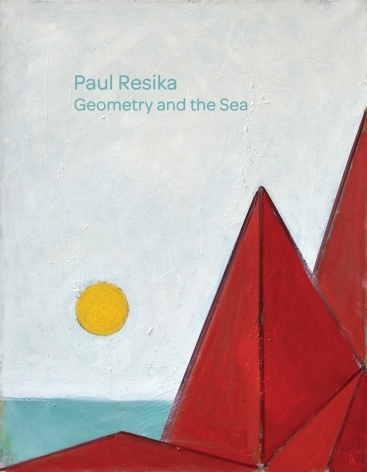 Paul Resika: Geometry and the Sea will be on view from April 19 – May 26, 2018. A reception will be held on Thursday, April 19th from 6:00-8:00pm. Gallery hours are Tuesday through Saturday, 11:00 am to 6:00 pm. For additional information and/or visual materials, please contact the gallery at (212) 750-0949 or by email at info@booksteinprojects.com.